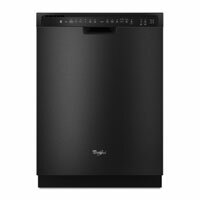 Sturdy and stylish-looking in smooth colors, this Whirlpool dishwasher has an enviable capacity for all types of dishes, including big pots and pans. Convenient wash cycles include an eco wash that optimizes water and energy use and a useful 1-hour wash for those lightly soiled dishes. The dishwasher even takes some of the guesswork out for you by using its automatic sensors to determine the most efficient cycle for your plates and glasses. We were satisfied by how quietly it works and by how it leaves dishes clean and dry at the end. At just $404.99, it’s a top performer.